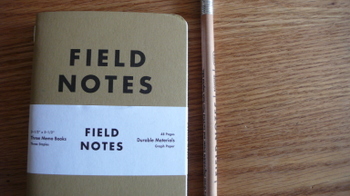 My field notes arrived from Coudal today. Lovely things. I like that thought. That's probably why I take notes too. But this bit's the best bit. A detailed and comprehensive review of the decisions and materials that went into making this little book. It makes you realise it's not all simple and obvious, it makes you think about the content and production of the thing and that's something we're increasingly going to have to do. 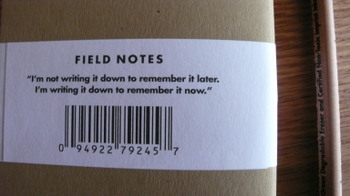 Adding information to physical goods (in a non-digital proto-spime kind of way) is a good habit to get into. So it's just a note book? Am I missing something? Very good. 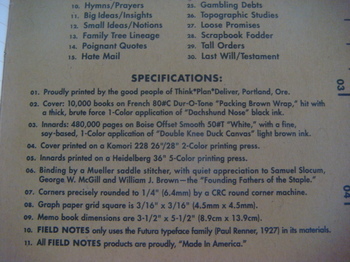 Especially the specification bit. Ooh a competitor to Moleskine...nice. Congrats on the 3rd most influential digital type person in the NMA. very nice. have you also seen bb/saunders' 365pages books. definately worth getting your hands on one of those, if not for the lush design, then for the bubbled clear cover. also the london design museum do a similar notebook with specs printed on the covers. Where did you get that bad boy from? Was it in the UK?